Well, we've come full circle. 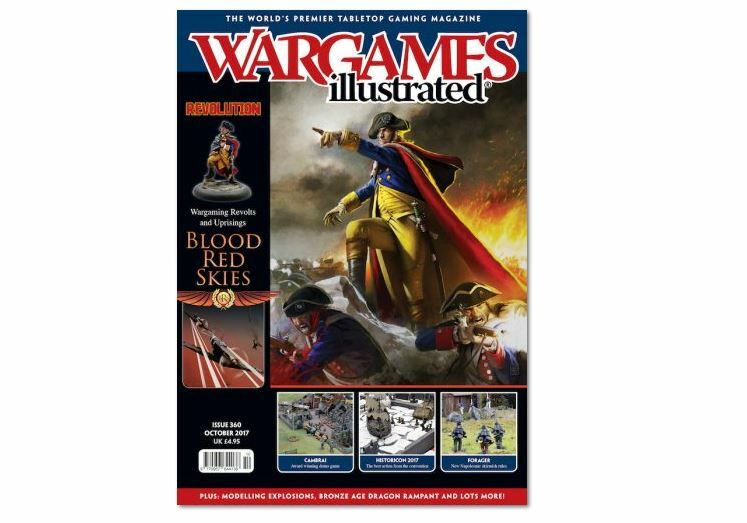 At least, Wargames Illustrated has, of sorts. They have issue 360 of their fine gaming publication now available to order. So if you want to fill up more of your day with great gaming content, you don't have to look much further. Mitch Reed takes a look at the opportunities for tabletop gaming in a time of Revolution. To the barricades! We met up with rules writing ace Andy Chambers to try out these new WW2 air combat rules coming soon from Warlord Games. Whether you are inclined towards calling it a ‘Revolution’ or a ‘War of Independence’, AWI/AR/RW enthusiast Steve Jones would like to provide you with a brief guide to gaming the AWI. Our annual round-up of the action at one of the biggest and best conventions on the US scene. The penultimate part of our series on James II takes a look at the revolutionary actions of those who would seek to overthrow the king. Everything you need to know about this characterful Napoleonic era skirmish game from the team at Stand To! Games. We turn our attention to the French Revolutionary Wars now as Colin Ashton and David Bickley tell us about their inaugural Big-Ash Bash. THEME: SO YOU WANT TO FIGHT THE RUSSIAN REVOLUTIONS? In the month of its centenary, Dom Sore provides an insight into the gaming possibilities provided by the Russian Revolution of 1917. We visited these masters of MDF to find out more about the processes they use and their range of products. Featured at Salute 2017, this game by the Sons of Simon de Montfort club expands upon Orwell’s classic novel and adds a whole new, unique aspect to the story. We take a look at this excellent display game from the show earlier this year, with some additional insight into the creation of the tabletop set up. No game is complete without the odd explosion, so here’s how you can make yours look particularly good during your gaming. Your handy guide to the various manufacturers featured in this month’s magazine.